According to P. G. Wodehouse, cats have never completely gotten over the snootiness caused by the fact that in ancient Egypt they were worshipped as gods. Their domestication, however, goes back even further to the Stone Age when a Cypriot grave, estimated to be about 9,500 years old, was discovered with the remains of a cat buried beside a man, suggesting a close bond between human and feline. In ancient Egypt, cats were essential to everyday life as they protected the storehouses of grain situated along the banks of the Nile River that were suseceptible to infestations of rats and mice. 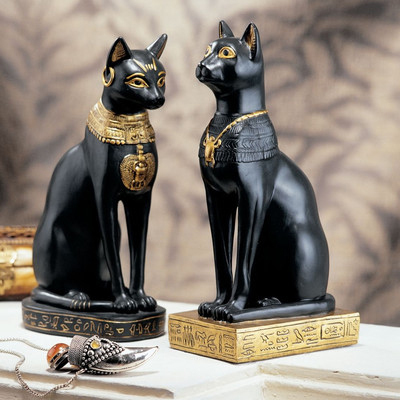 Although they later fell from grace, for centuries cats were worshipped as deities namely, the Eye of Ra, who by 1500 BC became associated with Bastet, a solar deity with the head of a cat that guarded the pharoah and became a symbol of motherhood and fertility. The sunrise, music, dance, pleasure and birth were all diverse aspects of Bastet's gentle and loving nature. The Greek historian, Herodotus, wrote of great festivals and magnificent temples commemorated in honor of Bastet. Tomb painitings and limestone reliefs from the 5th century B.C. 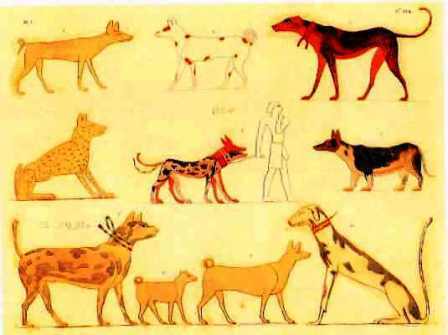 reveal the adoration ancient Egyptians had for their dogs, which were often buried ceremoniously with their masters and mummified with great care. To display grief over the loss of a beloved dog, family members would shave their eyebrows. The Egyptians linked the dog to the jackal god, Anubis, who guided the soul of the deceased to the Hall of Truth where the great god, Osiris, determined its final judgment. 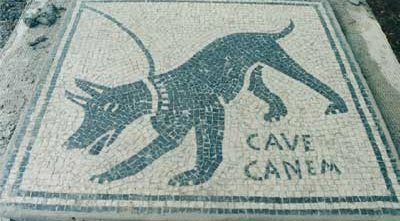 In ancient Rome the well-known mosaic, Cave Canem (Beware of Dog) reveals dogs as guardians of the home just as they had been in earlier cultures and still are today. 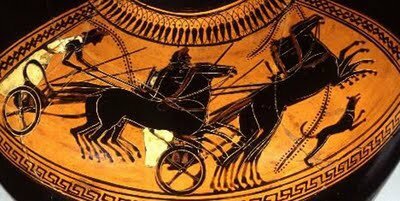 The great Latin poet, Virgil, wrote: "Never, with dogs on guard, need you fear for your stalls a midnight thief. " Other ancient cultures revered animals as well, including Sumeria and India where animals were often depicted in literature and various art forms. Today, anything goes, as artistic expression serves many prurposes for many people. While pets are cherished in our society, they are not relegated to godly status as they were in the ancient world; hence, their depictions reflect the vision (and madness) of the inidividual artist. As such, they can beome incorporated into landscapes, still-life, portraits and caricatures. Some artists find fulfillment in mimicking the world's most famous paintings, styles and subjects. 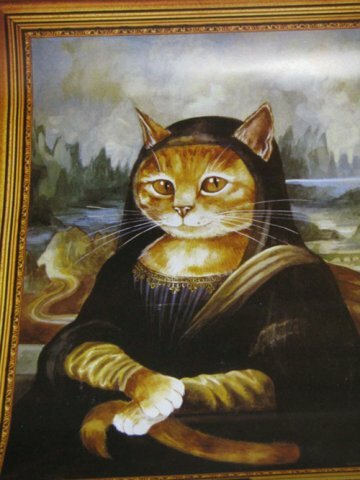 The cat lady above may not be known for her smile, but would Leonardo Da VInci have gotten a kick out of how a modern artist interpreted his timeless masterpiece?One can only guess, but the cat depicted does share the seductive mysticism so apparent in the Mona Lisa albeit not her exquisite countenance. 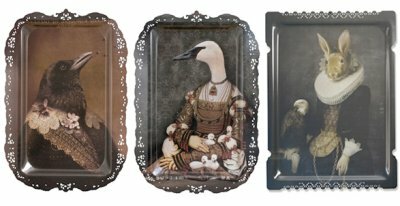 Consider curtseying now to Queen Rabbit, Her Royal Hghness Duck and His Regal Majesty Crow. Remember those somber portraits of the kings and queens of England that graced dusty stone castle walls? All the Tudors and Stuarts and every royal house except for maybe Usher was depcited with the regal portraits of kings , princes and queens either in solitay stance or amid a panorama of foxes, hounds, horses and such. Deep, dark colors often rendered gloom and doom despite the obvious trappings of lives of luxury. 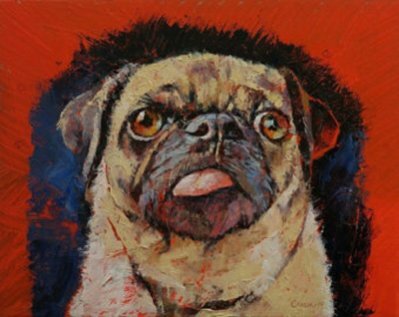 The adorable painting above is proof that animal portraiture today has no conventional parameters; it can be funny, whimsical, traditional or just plain cute. Consider that painted depictions of humans sticking their tongues out for the entire world to see are rare if they exist at all. 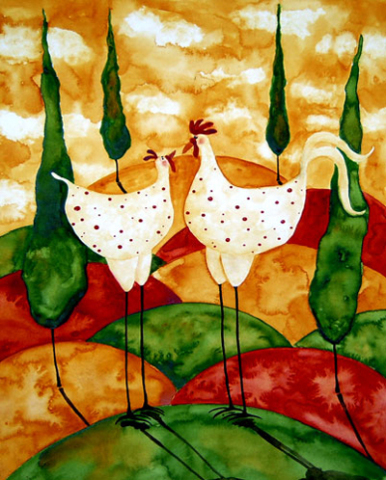 Although sentimentality over chickens is a debatable concept, the whimsical pair of chickens in love is colorful and endearing. Artistic expression can also have an edge and transport the viewer for a walk on the weird side. 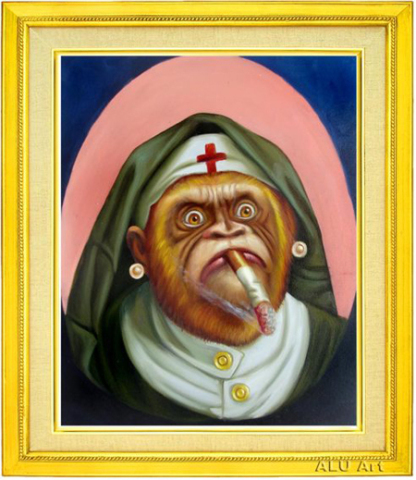 Consider the image above of a monkey bearing a Red Cross hat and smoking a cigarette. The message of this work is somewhat obscure (smokers need the Red Cross?) but the feeling it evokes is more than a little creepy, unless of course, monkeys that smoke are commonplace in your world. 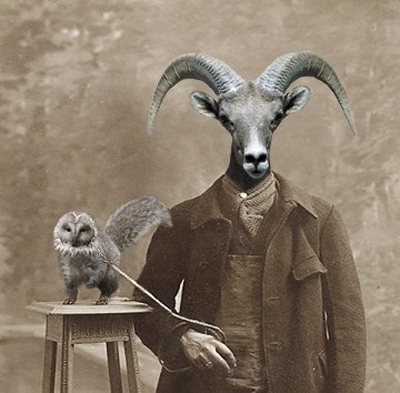 The super-imposed images of a ram posing with a pet owl on an old photograph with a sepia background evokes an edgy sentimentalism and a bizarre view into the ties that sometimes bind. Who they are and who lay underneath their images remains a mystery, but captured in this moment in time they are, at the very least, an odd couple indeed. 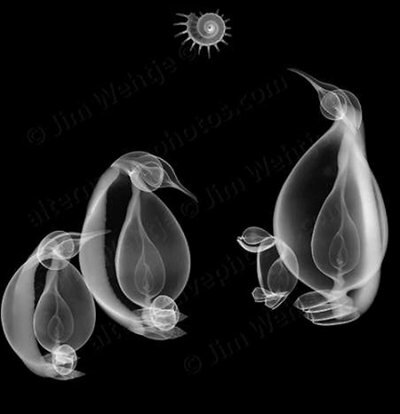 Using unusual mediums to create artistic details can be illustrated in the image above where penguins are depicted as forms on an x-ray. The sky is the limit when it comes to artistic expression where the only limits are those imposed by the artist's own imagination.